Its always good to have a few birds available when creating a new painting! I have several more in the collection but they are too large for these pages! And I like to carve the same bird in different poses. Then they are good for opposite sides of your work! Crows in a variety of sizes are my favorites! Tell me your favorite bird and how you use it! We all have such different ideas. thanks for the kind words. currently there is a catbird mom bathing in our birdbath daily. 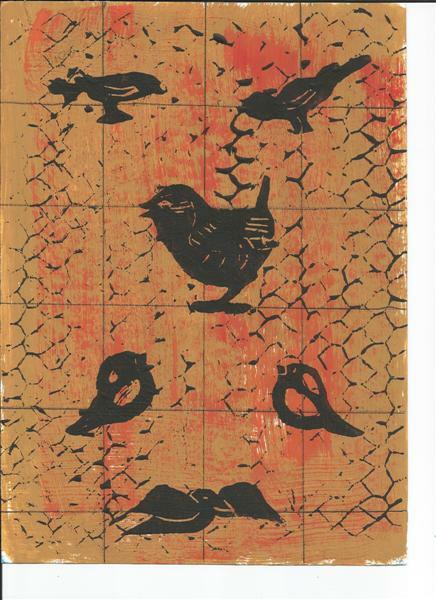 love all your birds…one of my favorite stamp cut birds is my gold finch which I stamp upside down. Okay, THIS is the one that I had to say… What a cool collection of birdies. I love the big middle bird because he looks all feisty and stuff. And I also love the little one on the bottom right. But they are all sweet. sweet sweet!